Set in Helsinki in a dystopian future, when global warming has advanced to the point that anyone who can afford it has moved north to heavily-fortified compounds, social services are failing in the face of crime, disease, and chaos, and the rain never stops, a poet is searching for his wife, who has disappeared while following a story. She’s a journalist investigating a string of murders committed by a man who calls himself The Healer, who is targeting those who he believes are responsible for crimes against nature. Tapani Lehtinen is sure something bad has happened to Johanna, but he knows there is little the police can or will do. They are barely able to investigate homicides, much less missing persons. Yet Lehtinen is able to make an alliance of sorts with Harri Jaatinen, a tired police inspector who knows Johanna and thinks she was on to something. He gives Lehtinen what he knows about The Healer. Both of them are persistent in spite of having very little to give them hope. The novel is not entirely successful as crime fiction.Our narrator is most definitely an amateur sleuth, though he has some of the trappings of the hardboiled PI. He stumbles upon clues, makes leaps that are based more on coincidence and convenience than detection, falls into fugue states where he reminisces about his relationship with Johanna. He’s aided by Hamid, a cab driver who has migrated to Finland as part of a mass migration northward, who is fortuitously able to provide Lehtinen with help at critical times. But that’s okay. The plot — the search for Johanna and her involvement with The Healer — is not the driving force of the novel. Rather, its the vision of a not-so-distant future in which a poet and a policeman have very little to sustain them other than a belief that they must go on, doing what they believe in. Jaatinen is sustained by his work. (“I’m a policeman. I believe in what I do.”) Lehtinen’s love for his wife — and his poetic belief in the importance of love — is his major motivation. This is in contrast to The Healer, whose fanaticism is blind and violent. In the end, both radical responses to environmental catastrophe and individualistic consumerism turn out to have more in common than Lehtinen’s more modest belief in trying to do the right thing and in the power of his love for Johanna. There’s something very likable about Lehtinen, who seems quintessentially Finnish in a Finland that has changed beyond recognition. Antii Tuomainen started his writing career in advertising. The Healer, his third novel, won the Clue Award for best Finnish crime novel. It is being translated into 26 languages. I got an advanced copy through the LibraryThing Early Reviewers program. 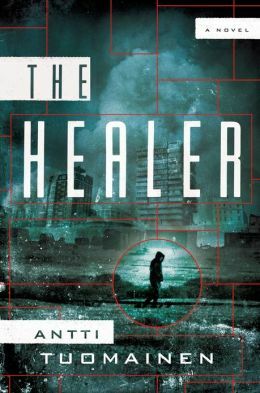 The Healer, translated by Lola Rogers, will be released in the US in May, 2013. This entry was posted in finland, reviews and tagged Antti Tuomainen, The Healer. Bookmark the permalink. Thank you for reminding me of this one, Barbara. You’re not the first trustworthy blogger who’s ‘told’ me this is worth the read. I have to confess I forgot to put it on my TBR list. You’ve reminded me that I should. I enjoyed this unusual read. I’ll definitely be reading more of this author.